The Holy Temple Wooden Lyre Postcard. Measurements: 6.75 x 4.75 inches or 12 x 7 centimeters. 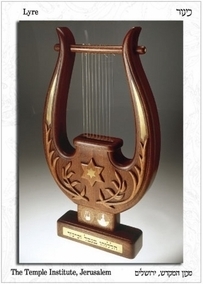 An accurate reconstruction of the Lyre of the Holy Temple. This beautiful postcard is made and printed in Jerusalem.